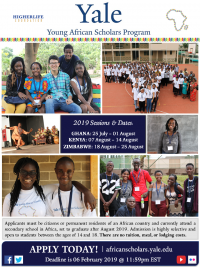 The Yale Young African Scholars Program (YYAS) is an intensive academic and enrichment program designed for African secondary school students who plan to pursue tertiary education and wish to make meaningful impact as young leaders on the continent. Participants will enhance their academic skills, receive university admission and financial aid application guidance, and join a network of young leaders from across Africa. Following the program, students will be paired with mentors who will help advise them throughout the university application process. All eligible students are encouraged to apply, however please note that our admissions committee will give preference to high-achieving, low-income (i.e. “HALI”) students who do not have university guidance in their schools or communities. There are no tuition costs for participation in the YYAS Program. Room and board will be provided for all students, along with three meals a day. However, participants ARE responsible for any passport and/or visa related expenses, and for getting themselves to the venue at the outset of the program and their return home at the end of the program. Participants will also be responsible for any incidental expenses they elect to incur. Please note that students from low-income backgrounds who demonstrate financial need may apply for a limited number of travel grants offered by the program. If awarded, the grant will cover the cost of a roundtrip plane ticket between a student’s home country and the program location. It will NOT cover costs associated with the passport and/or visa. Students can only apply for travel assistance after they have received an offer of admission to YYAS. For more information please visit our FAQs page. Available in English, Français, عربى, and Português.